In 272AD, a small person named Flavius Valerius Constantinus was born in the Roman Castrum at Naissus, which today is the city of Nis, Serbia. Wee Flavius would skyrocket to fame and fortune as Constantine the Great (272-337), a Roman Emperor remembered mostly for being the first to convert to Christianity, and for moving Rome's center of power to Byzantium, naming the city of Constantinople after his own bad self. The reason Constantine pertains to a starfort is that, the current Nis Fortress was built atop the ruins of many previous fortifications, one of which was that Castrum of his birth. Nis (named for the Nisava River, beside which it sits) is one of those places that dates back to some of the earliest human habitation: Neolithic settlements there are thought to go back as far as 2,000 to 5,000 BC. As long as there have been places to build fires and collect water folks have been ready to fight over them, and a series of tribes I've never heard of inhabited the region prior to the Romans first officially making noises to the effect that this was now their city, in the 2nd century BC. 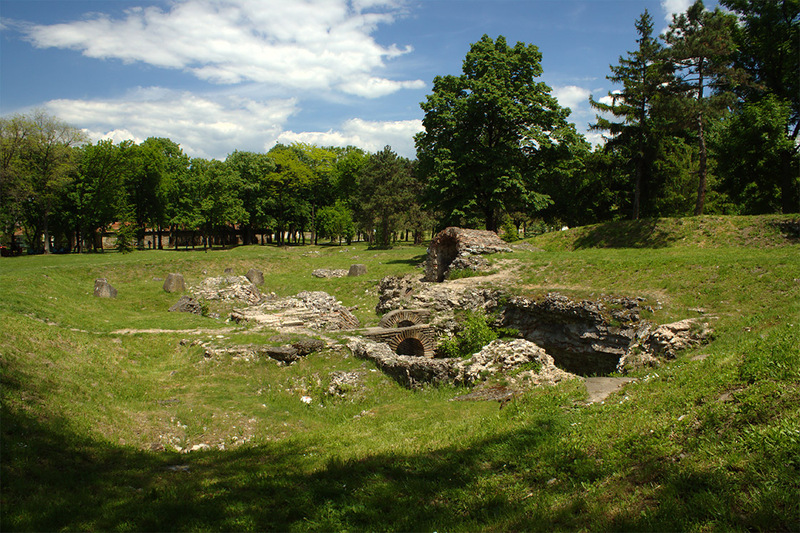 The Romans rebuilt their fort at Nis in 550AD, which was taken from them by the Slavs around 615. 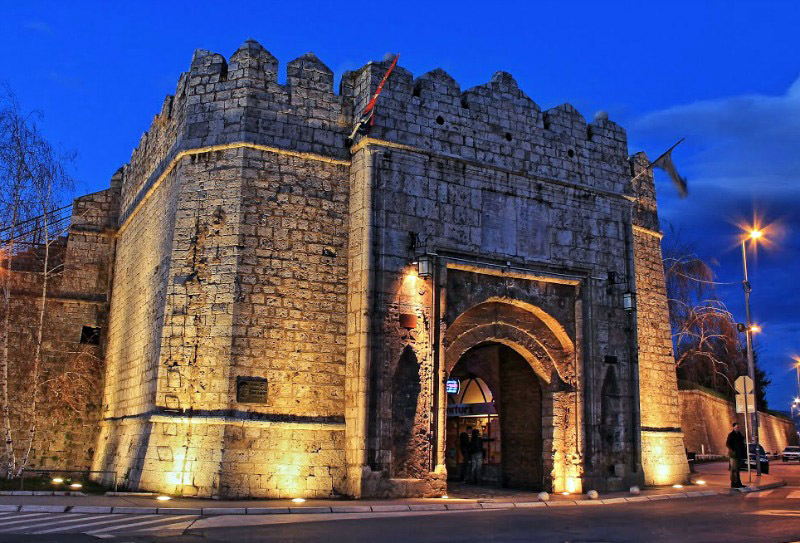 By the 10th century the "Nicholas Fortress" had been upgraded to an ultra-hi-tech medieval fort, and ongoing conflicts betwixt the Byzantines, Hungarians and resident Slavs made constant strengthening a necessity for the fort, and those who wished to stay in it. Byzantium, the Bulgarians and Serbs all dashed about the area hacking at each other for the next couple of centuries. 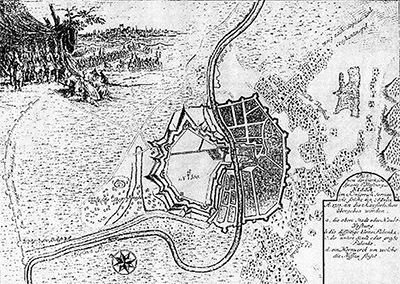 A map of Nis Fortress, half of the fortified city of Nis, in 1737. The Turks finally entered the lucrative Nis-occupying business in 1386, when they conquered the town and razed the fortress. The city bounced back and forth between the Ottoman Turks and Serbians a few more times (and the fortress was rebuilt and re-razed) until 1443, when the Turks finally laid down roots in Nis for the next 241 years. The Ottoman Empire used Nis as a seat of its civil and military administration, but this period was not a happy one for the locals, many of whose disembodied heads were used to entertain those passing through the region. The War of the Holy League (1683-1699) brought Nis under Austrian control in 1689. 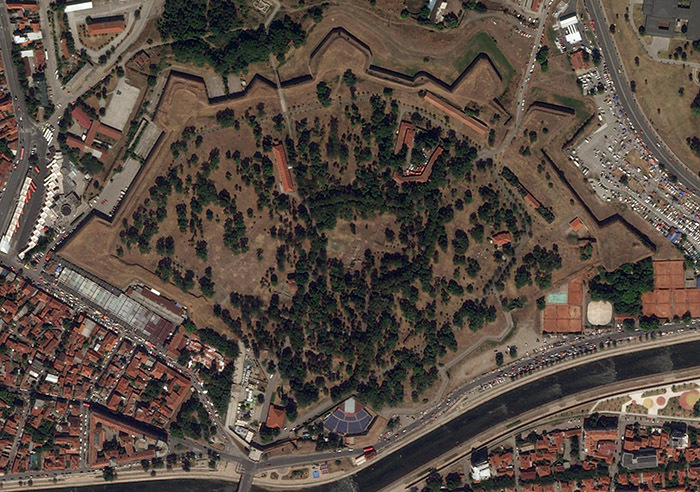 The Habsburg Austrians built two "strong bastions" (free-standing starfort bastions?!) atop whatever steaming pile of rubble represented Nis Fortress in 1689, but the city was recaptured by the Ottomans once again in 1690. Sultan Suleiman II (1642-1691) decided to put an end to all of this Nissian capturing and recapturing foolishness by decreeing the construction of a fortress of the Vauban fashion, to which was alternately referred as the Italian Style. Which is weird, because Vauban was most assuredly not Italian, but the first starforts were Italian, so we'll allow the 17th century Turks their little linguistic incongruity. 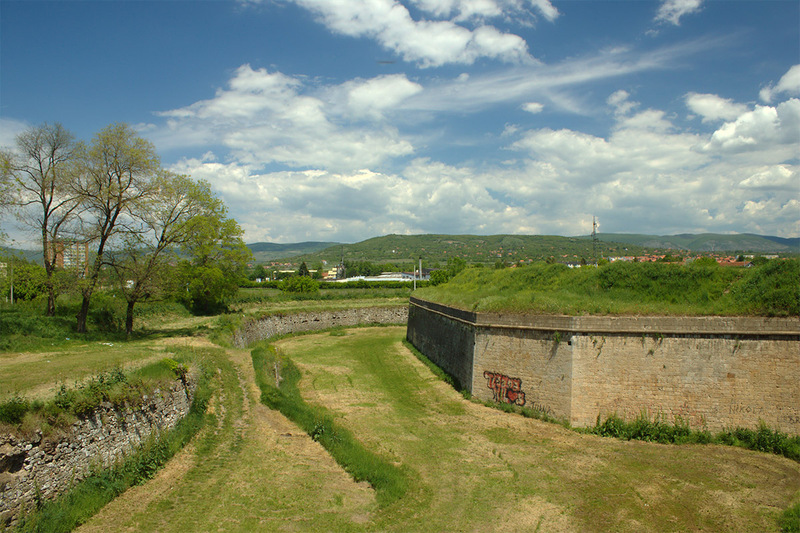 It's difficult, looking at what's left of Nis Fortress today, to think of it as a starfort of the Vauban style...primarily in that there is clearly a pleasing jumble of seven bastions on the fort's northern side, but the rest of Nis Fortress consists of relatively undefended straight curtain walls. 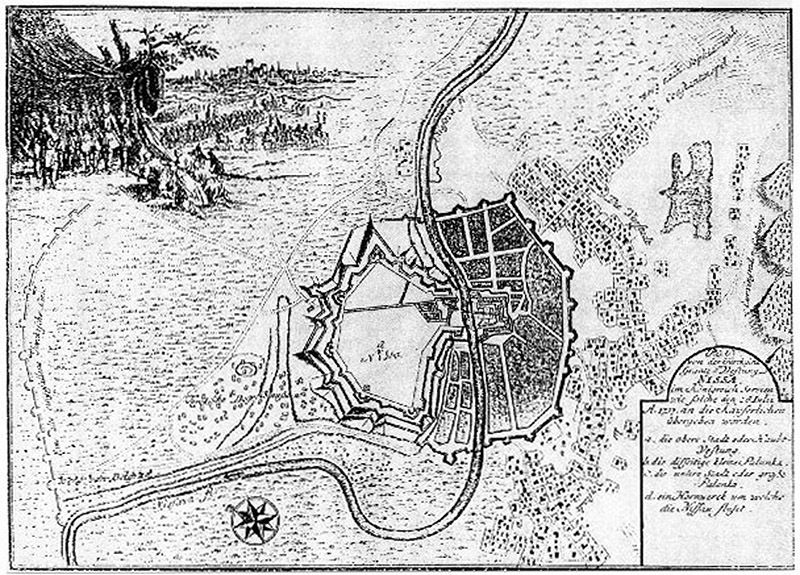 A look at the 1737 map, however, shows that the "flat" end of the fortress faced the Nisava River and the city itself, which was in turn surrounded by a bastioned trace of its own. The fortress itself is pretty darned large, with 26-foot-high, 9-foot thick walls. Those walls are a total of 2100 meters (1.3 miles!) long, covering an area of 80 acres. The remains of what were probably some lovely Turkish structures, within the walls of Nis Fortress. 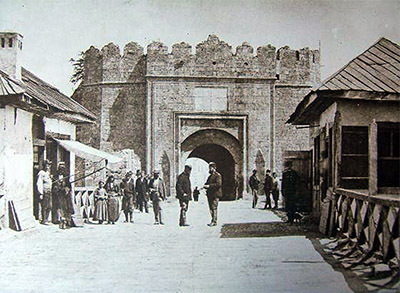 Nis Fortress was provided with four major gates and one small "pursuit door," which led to trenches surrounding the city. Of those four large gates, the Stambol Gate seems to be the image that best represents the fortress in the public imagination, as approximately 97.45% of all images that come up in a Google search for Nis Fortress are of that gate. Not to say that there's anything wrong with Stambol Gate, but heroic shots of bastions are a way better representation of a starfort. Just sayin', people in Nis with cameras. Nis Fortress' Stambol Gate, as it appeared in 1878. 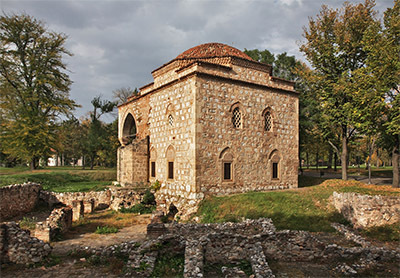 The fort's interior was divided into the Hunkar (Emperor) side, in which the city's rulers resided, and the larger Edirne Bali side, which contained taverns, a bakery, a blacksmith, a botanist (?) and a number of shops. A superduper strong starfort was a necessary extravagance for the Turks at Nis, as it was now on the border with the wicked Austrians. The Habsburg Empire occupied central Serbia from 1718 to 1739 (which period, tellingly, mirrors that of the construction of Nis Fortress), where they established the Kingdom of Serbia. This region would be bonked back & forth betwixt the Turks and Austrians on a few more occasions over the next century. 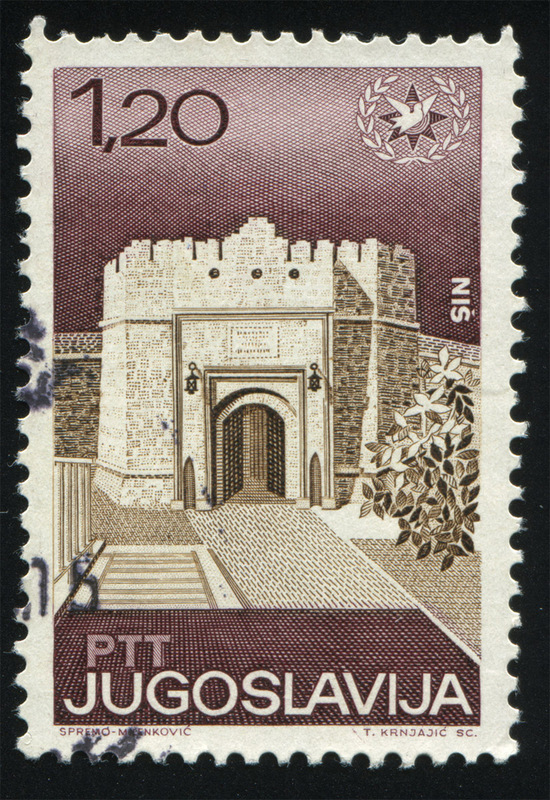 The Fortress of Nis didn't accomplish its intended mission in 1737, when the city and fort were captured by the Austrian army, who proceeded to make some additions on the fort. The Austrians gave up the fortress without a fight when the Turks rolled back into town a few months later, however. Perhaps the events of 1737 had been orchestrated by the Turks, who conspired to invite their enemy into their new fortress for a brief period, knowing that the busybody Austrians would be unable to resist the compulsion to improve the defensive works? Brilliant if so, and an inexpensive way to enhance one's fortifications. The flinty Serbs made their first serious attempt to throw off the Turkish yoke in the form of the First Serbian Uprising. This conflict lasted from 1804 until 1813 and resulted in some Serbian successes, but quarrels amongst the Serb's leaders as much as Turkish action led to an unsatisfactory end to the rebellion. By the 1840's, about half of the Nis region's population was Bulgarian, a people who were generally treated more favorably by the Ottoman rulers than were the Serbs. This led to tension amongst the folk, which must have been a shock, as this area had been so peaceful up 'til then. The Nis Rebellion was borne of this ill-balance in 1841, to which the Turks responded by burning 120 villages in Nis' surrounding area. Some of Nis Fortress' northern walls. A recent visitor to the fort commented on how relatively clean and devoid of trash was the interior of the fortress, compared to the rest of Nis...but scallawags with spraypaint are a clearly different matter. The Ottoman Empire was on its last legs in the middle of the 19th century, but it had been on those last legs for quite some time. Just about everybody in the eastern hemisphere understood the Ottomans to be the "sick man of Europe," a dying empire which, at any moment, would collapse in on itself under the weight of centuries of expense, obligation and hidebound Islamic tradition...but the Ottomans themselves hadn't yet received the memo, and clung to what they could, for as long as they could. 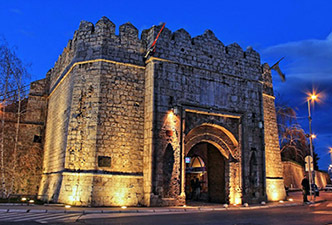 The first mosque built in Nis Fortress was the Bali-Bey Mosque, which was built from 1521 to 1523. Does it seem to be in suspiciously good condition? Well it should, because it was reconstructed in the 1970's. This was the site of the fort's library until 1877, and is today the home of Salon 77, an exhibition space. The struggle for independence raged on. Serbia, Montenegro, Romania and Bulgaria had collectively managed some pretty spectacular gains against the Ottomans by the 1870's, and when Russia finally threw its weight behind the Balkan states, the resulting Russo-Turkish War (1877-1878) ended up with an independent Serbia (sort of: The Austro-Hungarian Empire was still more or less in charge of things) in 1878, and got those Turks out of the Balkans forever. Just kidding! Those dogged Ottomans were still holding onto European territory, which was rectified in the First Balkan War (1912-1913), but then slightly unrectified by the Second Balkan War (1913). Nis served as the headquarters of the Serbian army during these conflicts, and Nis Fortress was doubtless used in a martial capacity. 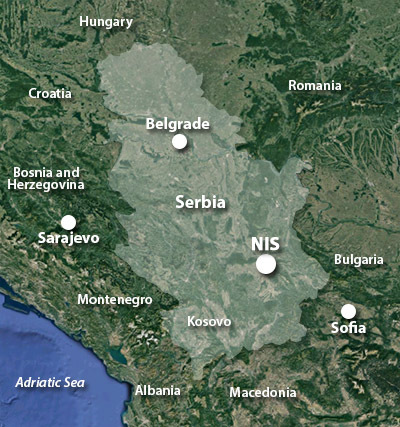 Nis was Serbia's capital city during the First World War (1914-1918), but things did not go well for Serbia, and the Central Powers captured the nation in 1915, at which time Nis was ceded to Bulgaria...who, in the proud tradition of the Ottomans, Austrians and Serbs, now took their turn occupying Nis Fortress! Did the Bulgars make any improvements to the starfort of our current interest? Doubtful. Whatever they accomplished, the Bulgarians were ejected in October of 1918 by the First Serbian Army. The conclusion of the First World War brought with it the conclusion of the Austro-Hungarian Empire, which had had nominal control over Serbia and its surrounding states. Thinking that safety came in numbers, Serbia, Croatia and Slovenia formed the Kingdom of Yugoslavia on December 1, 1918. Only nobody called it Yugoslavia until 1929: it was known as "The Versailles State" until then, referring to its official creation as part of the Treaty of Versailles (1919), which carved up the spoils of the First World War in a manner that guaranteed there would be a Second World War. Despite Yugoslavia's hope to remain neutral in the Great War Part II (1939-1945), Germany, Italy and Hungary invaded, and the Nazis occupied most of Serbia in 1941. 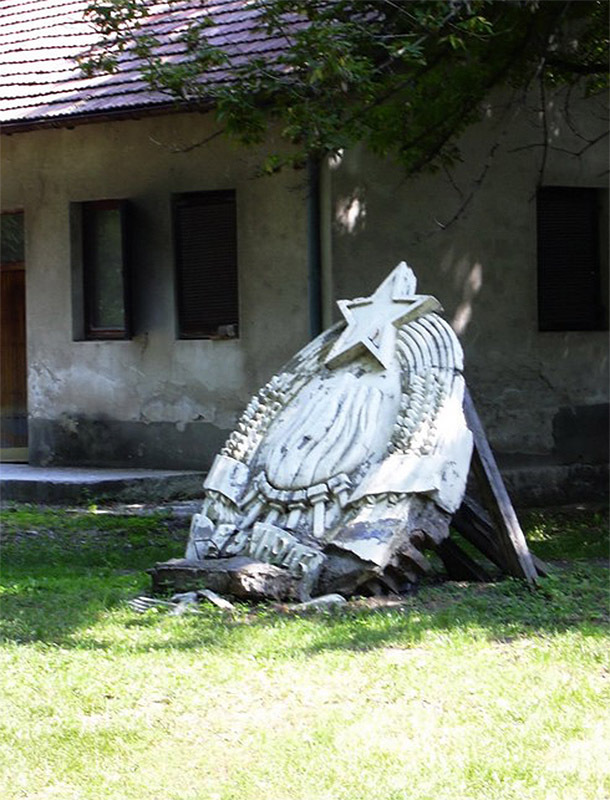 Nis became the home for Germany's first concentration camp in Yugoslavia, which camp would process some 30,000 persons, 10,000 of whom were shot in the nearby hills. Nobody seems to be saying anything about whether the Nazis made use of Nis Fortress during their time there, but historically Nazis were fond of starforts, and tended to make use of them when they were available. While Nis Fortress may or may not have played a part in Germany's Second World War unpleasantness, it was at least the backdrop for the first of only two occasions on which the United States and Soviet Union actively, if semi-mistakenly, fought one another. One of the few remaining vestiges of Nis' Yugoslavian era is this coat of arms, chipped from the facade of the local university, sitting dejectedly in Nis Fortress. Thanks to Carine Markovic at Voyages.Ideoz.fr for the photography and a cool online tour of the fort! 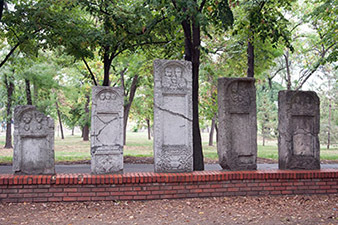 Nis had been liberated from the Nazis by the Bulgarian army and Yugoslav partisans in October of 1944, but the German army was still active in the region. On November 7, 1944, a flight of US Army Air Force P-38 Lightnings repeatedly strafed a column of Soviet Red Army trucks on the road from Nis to Belgrade, reportedly mistaking them for Germans. Soviet Yak-3 fighters lifted off from the airfield at Nis to protect the convoy, and the American fighters began to attack them as well. 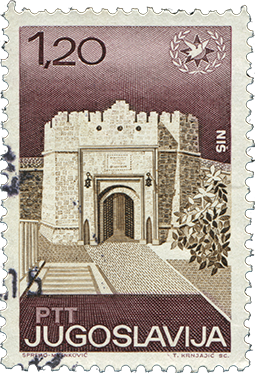 Nis Fortress' Stambol Gate, immortalized in a 1967 Yugoslav postal stamp. A pitched air battle over Nis Fortress ensued, resulting in at least 3 or 4 fighters lost on both sides. Each side insisted they had mistaken the other for Germans, though a Yak-3 looks a lot like a British Spitfire with big red stars all over it, and a P-38 looks like nothing in the world other than a P-38. Things can certainly get confused when somebody's shooting at you, but one imagines that there was at least a little bit of willful self-deception going on in this situation. Things in Yugoslavia turned out swell for Communist partisans, who had fought heroically to toss out the invaders, and after the war they were running the country. Josep Broz Tito (1892-1980), as president/ prime minister/ dictator of the post-war "Second Yugoslavia," embraced the Soviet Union, and then rejected the Soviet Union in 1948, keeping the country Communist, but not aligned with the USSR. The death of Tito in 1980, and the Soviet Union in 1991, were also the death of Yugoslavia. Serbia, Croatia and Slovenia decided they didn't want to be a single country after all, and there was even more bloodshed. Events spiraled increasingly out of control, and in 1999 NATO air strikes killed 56 people in Nis. The military left Nis Fortress in 1950, and it became a public park. Today the NATO air strikes have mostly subsided, and Nis Fortress is an oasis of greenery in the bustling city center. Numerous cafés and restaurants, art galleries, souvenir shops and "catering facilities" are scattered throughout the fortress. A 3,000-seat Summer Stage was built inside the fort 1957, which is the home to the Nis Film Festival, and annual Nisville concert series. ...and just in case you haven't seen enough of that majestic Stambol Gate, here's one last pic.